Top venues for great murder mystery evenings and weekends with It's Murder. "We stayed at the Haughton Hall hotel for two nights whilst attending a Murder Mystery weekend put on by It's Murder. We have attended many of these weekends and can truly say we always enjoy this company, very professional." Many hotels and other venues warmly welcome us time and time again. This page is dedicated to them. 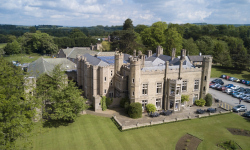 Cave Castle Hotel and Country Club is a beautiful Victorian manor house has been sympathetically refurbished and extended to offer 70 bedrooms. Nestling at the foot of the Yorkshire Wolds, it is the idyllic country retreat for a relaxing and tranquil stay. The price of our dinner events is £35 per person, £90 for a single dinner bed and breakfast or £150 for 2 people based on double/twin occupancy. Weekend events are £175 per person sharing a double/twin for two nights (£210 single occupancy). 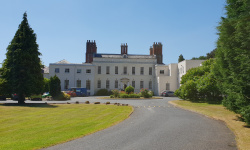 Haughton Hall is situated in the quiet beauty of rural Shropshire. Dating from 1718, Haughton Hall has been decorated with timeless style and situated in 35 acres of gardens, woodlands and even boasts a fishing lake, along with a leisure club with 15m swimming pool, gym, sauna and steam room. All Murder Mystery Dinners are £37.50 per person. Murder Mystery Weekends cost just £179 per person sharing a twin or double room and £219 for single occupancy. Upgrades to Manor rooms are £10 per room per night extra, Four Poster rooms are £20 per room per night extra and Suites are £30 per room per night extra, all subject to availability. STAY AN EXTRA NIGHT ON THE SUNDAY FOR JUST AN EXCLUSIVE £50.00 BED AND BREAKFAST PER ROOM EXCLUSIVE FOR MURDER MYSTERY WEEKENDS. West Lodge Park is a stunning country house hotel set in 35 acres of tranquil parkland, yet just 12 miles from Central London. 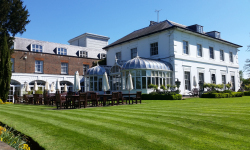 It was recently awarded the highest rating by the AA of any 4 star hotel in North London and Hertfordshire. A traditional country house hotel, but with modern touches such as free wi-fi throughout, it offers a personal and friendly service. The price of our event is £69.00 per person to include a sparkling wine and canapé reception and three-course dinner. Wood Hall Hotel and Spa in Wetherby was originally built as a country escape for the Vavasour family. Today, it remains a place where today's pressures seem an age away. Perched high on a hill with fine views of the surrounding area, Wood Hall offers 44 luxury bedrooms, a 2 Rosette restaurant and small health club and spa, it is a place of gentle relaxation. Prices from £49.00 per person and £209 per room based on two sharing. Single occupancy from £159. Whitley Hall Hotel represents the marriage of Tudor architecture with contemporary design, giving you the opportunity to revel in 16th century splendour and 21st century luxury. 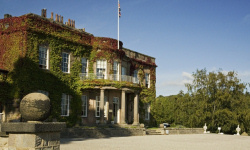 Whitley Hall Hotel is close to Sheffield and is one of the most luxurious hotels in the area. The event and a 4 course meal is £35.95 per person. The hotel is also offering the event, dinner, bed and breakfast from £175.00 per couple (offer based on 2 people sharing). 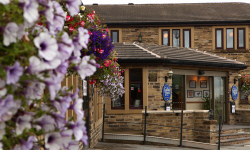 Best Western Bradford Guide Post Hotel is an affordable hotel in Bradford, with 39 spacious and well-equipped double bedrooms (and 3 suites), twins and family rooms. All have en-suite facilities and are fully central heated and secured with electronic keycard. There is also free WiFi and free car parking. The event is £34.95 per person and includes entertainment and dinner. To receive the hotel's latest offers and events, click here.